Isn't this stunning? If it just wasn't so hard to take a picture of it! They're finally blooming, my little collection of hybrid hellebores purchased at the end of spring the last few years. Some were without tags but I recognized the plant by their large, speckled leaves. I found some hellebores last week at our local garden center for $20 and was in a bit of shock, forgetting for a moment that I picked up mine on sale. The garden center manager reminded me they have always been on the pricier side and come in a wide range of colors and shapes. Hybrid hellebores get their common name from the rose-like flowers that appear in early spring around the Christian Lent observance. The "Lenten Rose" blooms are similar to poinsettias in that the colored sepals protect the true flowers inside. The wonderful advantage of adding these perennials to any garden is that the "blooms" last for several months and the foliage stays green for most of the year. My hybrid hellebores are in partial shade in rich, moist and well-drained soil. The biggest challenge enjoying the flowers is trying to see, and photograph, the downward-facing blooms so I have them planting along the gentle curve of my hillside. It does make it a little easier for photography but I can't say it helps very much in terms of seeing the flowers, I still have to get down to eye level without exposing myself to my neighbors. I add mulch every year to their flower beds and noticed that their crowns are now buried. I may have to lift them later, or move the mulch out from around them so the crown is back to soil level. In year's past, these have started to bloom late January to February, this is the latest that they have started. I tried out my thread snips to cut back the old greenery during a warm January day when I was looking for some sign of life. I will be adding compost to this area this year to make sure the plants have enough nourishment while they are blooming. 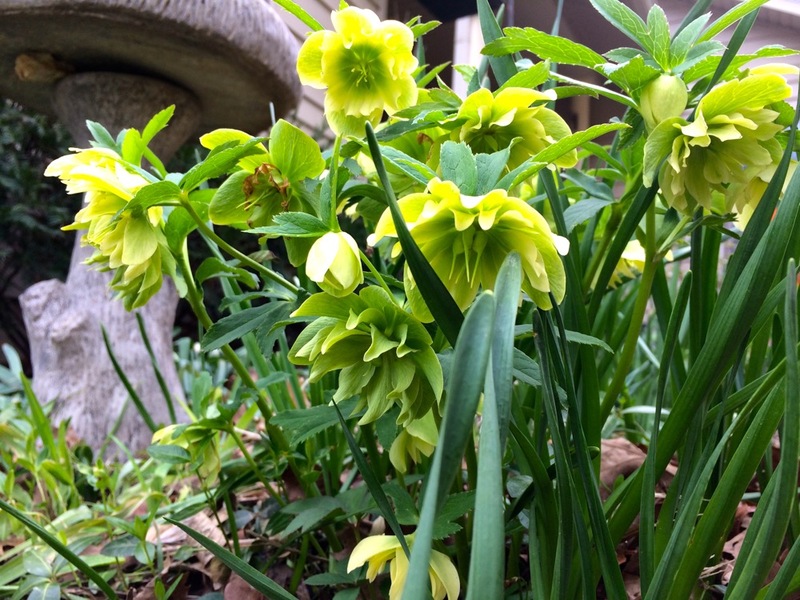 Here are my yellow hybrid hellebores all blooming in a bunch on my hillside. If you have a chance to pick up any hellebores on sale, jump on the chance. Regardless of the variety and color they may be, hellebores are a wonderful addition to a late winter, early spring garden.